Powers/Abilities: Oxygen Beam, removes oxygen from enemy, causing it to melt away. History: Mutated from a tiny parasite. Comments: Destroyah has three forms. 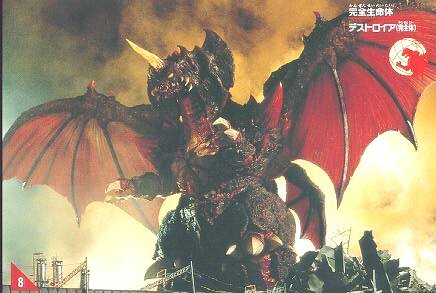 The Parasite form, the juvenile, large, lobster form, and the giant, evil, monster form. Thanks to Olivia Quirk for information and images of this character.